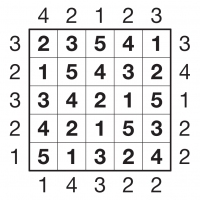 Skyscraper puzzles combine the row and column constraints of Sudoku with external clue values that re-imagine each row or column of numbers as a road full of skyscrapers of varying height. Higher numbers represent higher buildings. To solve a Skyscraper puzzle you must place 1 to 5, or 1 to whatever the size of the puzzle is, once each into every row and column, while also solving each of the given skyscraper clues. To understand Skyscraper puzzles, you must imagine that each value you place into the grid represents a skyscraper of that number of floors. So a 1 is a 1-floor skyscraper, while a 4 is a 4-floor skyscraper. Now imagine that you go and stand outside the grid where one of the clue numbers is and look back into the grid. That clue number tells you how many skyscrapers you can see from that point, looking only along the row or column where the clue is, and from the point of view of the clue. Taller buildings always obscure lower buildings, so in other words higher numbers always conceal lower numbers. Look at the solved Skyscraper puzzle on the left. The 1 clue on the top row has a 5 directly below it. This is the highest number in its column, reading down from the point of view of the clue, so it hides all the lower values and therefore results in that 1 clue. Consider the 3 on the bottom row of clues outside the puzzle grid. Reading up its column in order we see 31245. The 3 hides the lower 1 and 2 values, so there are 3 visible skyscrapers (3, 4 and 5) and thus the '3' clue. For one last example, consider the 3 clue at the top-left. Reading across its row we have 23541, where the 5 obscures the 4 and 1. Thus there are 3 visible buildings. Every Skyscraper puzzle only ever has one possible solution, and it can always be reached via reasonable logical deduction. In other words, guessing is never required. Skyscraper puzzles on puzzlemix appear at a range of sizes and difficulties. Usually they are 5x5, 6x6 or 7x7, in which case you must place 1-5, 1-6 or 1-7 into each row and column. Are you searching for help with Skyscraper puzzles? Stuck on solving Skyscraper? Don't know the instructions for Skyscraper? Need Skyscraper instructions? Want solving hints and tips for Skyscraper? Then puzzlemix is the place for you to play Skyscraper puzzles online. Looking for printed Skyscraper puzzles? Visit Sudoku Xtra for puzzle magazines and books. Or are you looking for a Skyscraper puzzle supplier? If so then check out Any Puzzle Media, my puzzle production company.